For other uses, see Bexley (disambiguation). 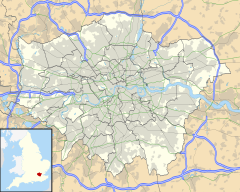 Bexley is an area of south-east London, England and part of the London Borough of Bexley. It is sometimes known as Bexley Village to differentiate the area from the wider borough. It is located 13 miles (21 km) east-southeast of Charing Cross and south of Bexleyheath. Bexley was an ancient parish in the county of Kent. As part of the suburban growth of London in the 20th century, Bexley increased in population, becoming a municipal borough in 1935 and has formed part of Greater London since 1965. Bexley was an ancient parish in Kent, in the diocese of Rochester, and under the Local Government Act 1894 formed part of Bexley Urban District. The urban district gained further status in 1935 as a municipal borough. Kent County Council formed the second tier of local government during that time. In 1965, London County Council was abolished and replaced by Greater London Council, with an expanded administrative area that took in the metropolitan parts of the Home Counties. Bexley Municipal Borough, Erith Municipal Borough, Crayford Urban District Council and Chislehurst & Sidcup Urban District Council were merged (less areas of Chislehurst and Sidcup that became part of the new London Borough of Bromley) into a new London Borough of Bexley. Bexley's main landmark is the Anglican church of St. Mary which lends its name to the London Borough of Bexley electoral ward containing the village. The ancient church's most distinctive exterior feature undoubtedly is its unusual spire which resembles an octagonal cone balancing on top of a truncated pyramid. Originally built in the Middle Ages, its monastic-style interior survived from the Reformation until the 18th century, before refurbishment in Victorian times. Among others, the scientist Henry Oldenburg was buried in the churchyard in 1677. Hall Place, a former stately home beside the River Cray on the Bourne Road out of Bexley towards Crayford, is where the Austen baronets lived. It lies to the north of Bexley at the foot of the road (Gravel Hill) up onto Bexley Heath (now covered in the modern day town of Bexleyheath). The house is unusual in that its two halves are built in highly contrasting architectural styles with little attempt at harmonizing them. The house and grounds are now owned by the London Borough of Bexley, and are open to the public. The gardens include a topiary display of traditional heraldic figures. Three walking routes pass Hall Place, the local council-sponsored Shuttle River Way and Cray River Way and the Mayor of London's "London LOOP" walk, which, shortly after its start at Erith, follows the Cray River Way from Crayford to Foots Cray. Danson House and the surrounding Danson Park in Welling are two of the main popular attractions in the London Borough of Bexley. The Shaw family, celebrated 19th-century architects came from Bexley: John Shaw (1776–1832) worked on Lamorbey Park and was a well-known architect in Kent and Middlesex, being one of the first designers of semi-detached housing in the capital. He is buried at St. Mary's Church; his son, John Shaw Jr, lived in nearby Crayford for a short time and owned a villa which was demolished in the early 20th century. Bexley railway station serves the area with services to London Charing Cross, London Cannon Street as part of a loop services both via Sidcup and via Woolwich Arsenal, and to Gravesend. Bexley is served by several Transport for London bus services connecting it with areas including Abbey Wood, Bexleyheath, Bromley, Crayford, Chislehurst, Dartford, Eltham, Erith, North Greenwich, Sidcup and Thamesmead. Old Dartfordians' War Memorial clubhouse, Bourne Road (home to the DA5 Club). This is home to both Dartfordians' Rugby Club and Dartfordians' Cricket Club. Bexley Cricket Club is based on Manor Way. Burnt Ash (Bexley) Hockey Club are also based at Manor Way, and play their home matches here, at Hurstmere School or at Erith School. ^ "Hall Place and Gardens". Bexley.gov.uk. Retrieved 19 March 2013. ^ "Borough of Bexley: Churches of Interest". Bexley.gov.uk. Archived from the original on 11 July 2012. ^ "St. Mary the Virgin Church, Manor Road". Stmarysbexley.co.uk. Retrieved 10 August 2012. ^ "Albany Park Baptist Church". Retrieved 19 March 2013. ^ "St. Augustine's". Retrieved 8 August 2018. ^ "St. John the Evangelist". Retrieved 19 March 2013. ^ "Burnt Ash (Bexley) Hockey Club". Retrieved 16 March 2013. Wikimedia Commons has media related to London Borough of Bexley. Chisholm, Hugh, ed. (1911). "Bexley" . Encyclopædia Britannica. 3 (11th ed.). Cambridge University Press.